Now before you all get worked up, I am a cat lover, I am even a slave to a house cat named Polly. But, I am a gardener and a gardener’s worst enemy is the neighbourhood cat that thinks your freshly seeded raised veggie bed is a litter tray! About a year ago I posted my plight on the Yates Facebook Page and in no time at all fellow Yates followers had offered their advice. Some made sense, such as using white pepper powder or orange peel as a deterrent. 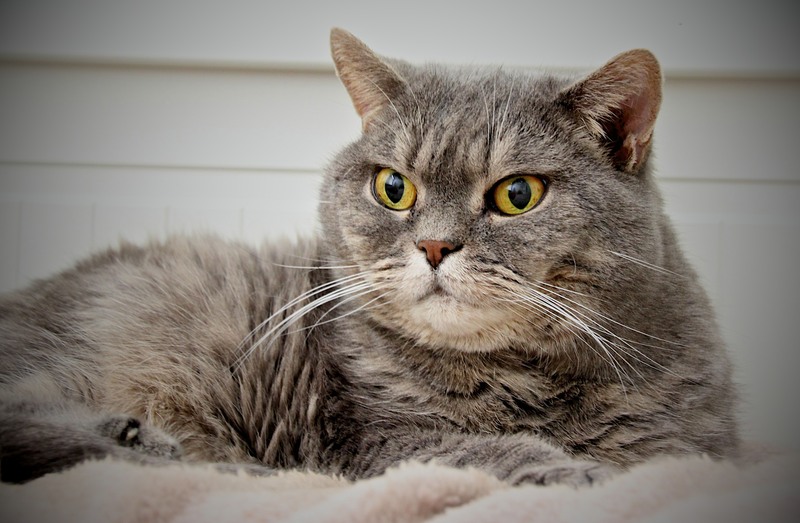 One person actually suggested planting a toxic plant to kill the cat (and claimed to have had success with said method)….. as you can imagine the person didn’t get a good response. By far the most successful method I have tried for deterring the local cats has been a easy system of growing sticks! Yes, that’s right. 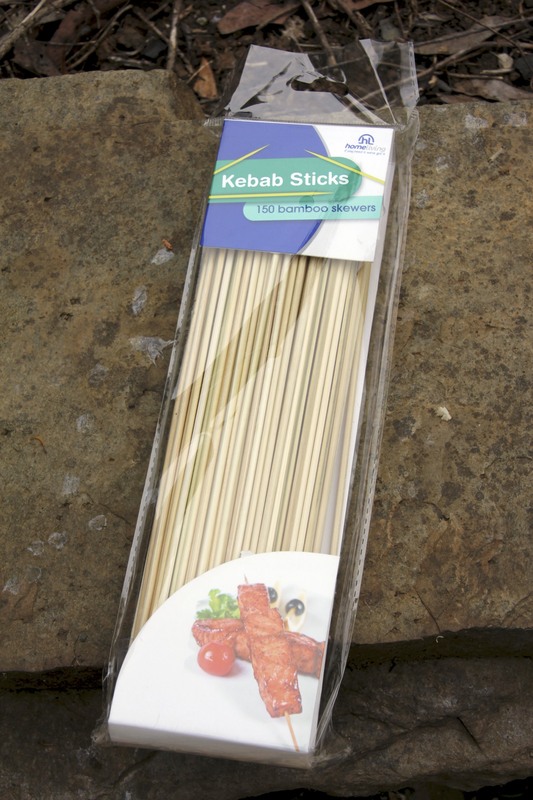 Armed with a packet of bamboo kebab skewers, I simply snap them in half or thirds and poke them into the veggie bed. 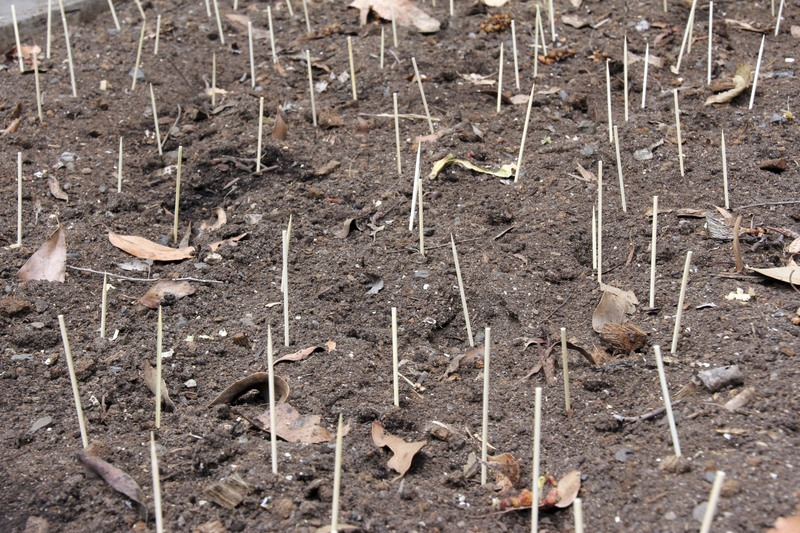 Sticks ready for planting out! Whilst the seeds are still considering germinating, it does look rather like I am growing sticks! The sticks seem to visually put cats and birds off walking over the veggie bed, I rarely see foot prints or have sticks flattened. So I am a happy gardener and no cats get harmed in the process, and that’s just as important to me! 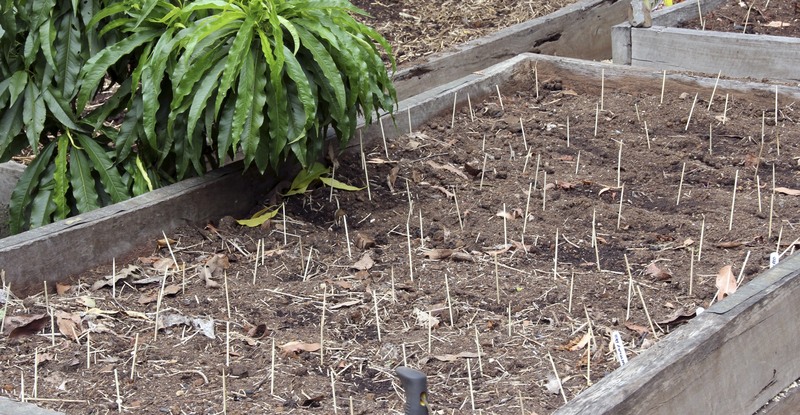 This entry was posted in Cats, Garden, Pests and tagged bird deterrent, cat poo, cats, feline, garden pests, gardening techniques, growing sticks, kitten, kitty, plant damage, seed protection, skewers as plant protectors, vegetable growing with cats about. Bookmark the permalink. 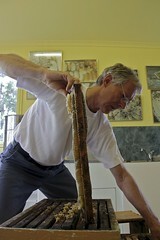 My father uses the stick method as he has three cats. He’s more of a cheapskate and uses whatever sticks he can find around the garden so there’s aren’t s many and they’re not as uniform. A cat has been known to still sleep on the seedlings however he persists with the practice so it must work to some extent. I will definitely want to try this handy idea. We’ve lots of birds *and* cats regularly making the rounds at our place and I will happily have them continue to visit as long as they’ll leave my helpless sprouts in peace.